Over time, corrosion of the building envelope will detract from its appearance and could lead to maintenance issues such as a leaking roof. 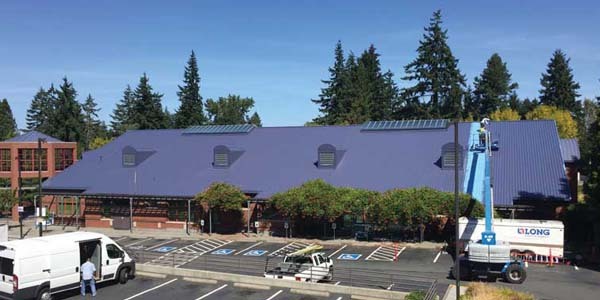 Waking up ‘tired’ metal buildings with a field-applied overcoating system can extend the service life of commercial and industrial structures, protecting them from further corrosion while enhancing the esthetics of the façade. Due to the diversity of factory-applied prefinished systems, and the diversity of potential field applied repaint systems, it is impossible to offer one comprehensive repaint procedure for all possible situations. However, it is possible to offer a set of guidelines to be considered in every potential situation. Successful overcoating of factory-applied coil coatings or galvanized finishes can be achieved when proper evaluation, surface preparation, and application techniques are followed. CSSBI advises consulting with an experienced local coating contractor can be a valuable first step. Figure 1: Before specifying a coatings system, a thorough investigation should be made regarding the amount of rust on the surface. 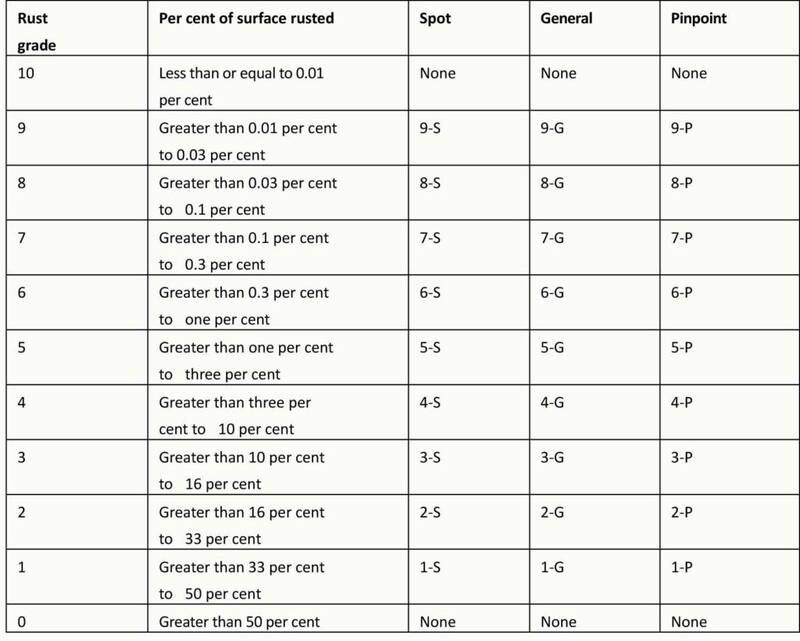 Individuals must select an area to be evaluated, estimate the percentage of surface area rusted, and compare their findings with the SSPC-VIS 2 table above. Among the variables that need to be evaluated to make a decision on overcoating is the condition of the existing coating system—beginning with the amount of corrosion present. ASTM International has published standard test methods using photographic reference standards to evaluate aged coating systems for rust and blistering. For this purpose, ASTM D610-08, Evaluating Degree of Rusting on Painted Steel Surfaces, uses a numerical scale of one to 10, where a higher rating indicates less rust (Figure 1). Developed in co-operation with the Society for Protective Coatings (SSPC), the visual examples depict the percentage of rusting on existing painted metal surfaces. Other overcoating risk factors can include film defects (e.g. cracking or blistering), total film thickness, number of existing coatings, and those coatings’ adhesion to the substrate and between coats. Defects such as blistering, cracking, and delamination of an existing coating system can disqualify a metal building as a candidate for overcoating, and extensive blistering can do the same unless spot repairs can be made. The size and density of blistering on painted surfaces can be assessed through visual examination of coatings in accordance with ASTM D714-02, Standard Test Method for Evaluating Degree of Blistering of Paints. Aged coating systems with multiple layers of paint, or with high film thicknesses and marginal adhesion, are also poor candidates for overcoating due to cohesive stress occurring when new coatings are applied. Typically, the higher the film thickness is, the greater the cohesive stress will be on the existing coating system. The number of existing coatings and their dry film thickness (DFT) can be measured with a Tooke gauge, magnetic pull-off, magnetic-flux film thickness gauge, or by visual examination of a paint chip cross-section. Prior to determining if an aged paint system is a candidate for overcoating, it is important to check adhesion of the existing paint system. Using ASTM D3359, Standard Test Methods for Measuring Adhesion by Tape Test, a delamination risk factor can be assigned on a scale of one to five, with one representing the lowest delamination risk after overcoating and five the highest (Figure 2) (For more on this method, see ASTM D3359-09e2, Standard Test Methods for Measuring Adhesion by Tape Test.). A worst-case scenario would be a multi-coat, high-film-thickness, existing coating system with poor adhesion between coats or to the substrate in a freeze/thaw environment. Aged paint systems with high delamination risk factors (4.5 to five) are generally not candidates for overcoating. Figure 2: ‘Adhesion results’ refers to the average of adhesion tests at a minimum of three separate locations, with three trials at each location in accordance with ASTM D3359, Standard Test Methods for Measuring Adhesion by Tape Test, Method A. ‘Delamination risk factor’ refers to the degree of risk associated with the existing system delaminating between coats or from the substrate following application of an overcoat system.